Description - This large, white owl has a rounded head and yellow eyes. Both sexes of the Snowy Owl have dark bars and spots although they are heavier on the larger female; old males may be pure white. This usually silent bird will sometimes utter a shrill whistle and hoarse croak on breeding grounds. Distribution - The snowy owl breeds in northern Alaska and in northernmost Canada; winters are spent throughout Canada and in northern United States. Snowy Owls prefer open country such as tundra, dunes, marshes, fields, plains and airports in the winter. 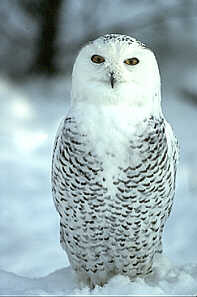 Biology - The Snowy Owl depends on lemmings for their major food source. However, the lemming population fluctuates from year to year so when the supply gets too low, the snowy owl will migrate south in great numbers. 5-8 white eggs are laid in a nest lined with feathers, mosses, and lichens which is placed on the open tundra.